This shows us that it is possible for God to be involved or un-involved in our work. It gives us an invitation. a motivation, and a test. The Invitation: In your work life, watch for God at work and join him there! The Motivation: Anxiety comes from a destructive motivator: I must perform well at my job to be significant in this life. This pressure will crush you and even harm you physically. Peace comes from a constructive motivator: God loves my and my significance is eternal and comes from joining him wherever he is at work. Whether in an employee, client, or project. The Test: How is your sleep life? Our health or physical state is often an easily accessible indicator of our spiritual and emotional condition. If you can't sleep because you can't "let go" of things that happen at work, then you may have made success or significance at work an inordinate goal in your life. 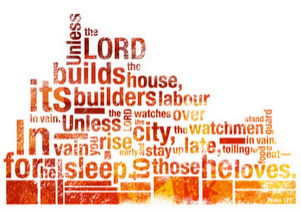 So when your spouse or child comes to wake you up on a Saturday morning, this is the scripture to have memorized! "Honey, 'he gives to his beloved sleep.'" You can't argue with that!